By "submitting this form via email, mail or checking the terms & conditions on our online reservation system, you (herein after referred to as Guest or Tenant) are confirming that you have read and agreed to the rules and regulations listed below and on property listing page. Guest reservation is subject to receipt of payment, submission of registered guest list and the understanding that guest will adhere to the terms and conditions provided by Front Desk Vacation Rentals, LLC. (Herein after referred to as FDVR or Front Desk Vacation Rentals, LLC.) Guest agrees to pay for all items specified and guest hereby authorizes FDVR to charge credit card on file for all payments due. GUEST QUALIFICATIONS: Guest/Tenant represent and warrant that you are at least 25 years old and provide only true, accurate, current and complete information about yourself, billing address and phone number provided to FDVR, must match info on file with your bank or credit card, you have sufficient authority, if you are purchasing on behalf of yourself, a company, group or organization to bind yourself, that company, group or organization to the Terms and Conditions. We do not accept reservations from frat/college age groups, loud music party groups or teen/prom groups with chaperones. Our rental properties are located within quiet, residential neighborhoods and are not ideal for loud, partying groups. We reserve the right to determine the number of children that may accompany a parent or guardian. Please call before booking if children outnumber adults. All registered guests staying in the unit and their ages must be submitted on the registered guest list. If you’re unsure of the number of guests while processing your online reservation, please enter an estimation and send back the registered guest list as soon as possible. MAX OCCUPANCY includes all guests occupying the property, infants under one years of age are not included in max occupancy. Please refer to rental property website page for max occupancy. Non-registered day guests are not permitted at the unit at anytime, unless pre-approved by FDVR. If there is evidence of non-registered guests on the property at anytime or if you’re in violation of the max occupancy, you will be asked to vacate the property without refund and will forfeit your security deposit...NO EXCEPTIONS. Our rental properties are located within quiet, residential neighborhoods and are not ideal for loud, partying groups. Each home is owned by a private homeowner and thus has the right to refuse rentals to anyone, of any age, at any time. Please help us maintain a good relationship with the neighbors and respect our rules. CSA VACATION RENTAL DAMAGE PROTECTION: As a part of your stay, you may purchase a Vacation Rental Damage Protection plan designed to cover unintentional damages to the rental unit interior that occur during your stay provided they are disclosed to management prior to check-out. If purchased, the policy will pay a maximum benefit of $3,000. Any damages that exceed $3,000 or are not covered under the plan will be charged to the credit card on file. If, during your stay at one of our rental properties, an insured person causes any damage to real or personal property of the unit as a result of inadvertent acts or omissions, the Insurer will reimburse the Insured for the cost of repair or replacement of such property up to a maximum benefit of $3,000. Certain terms and conditions apply. Full details of the Vacation Rental Damage coverage are contained in the Description of Coverage or Insurance Policy www.vacationrentalinsurance.com/g20vrd. The Vacation Rental Damage plan can be purchased up to, and including at, check-in. By submitting payment for this plan, you authorize and request CSA Travel Protection and Insurance Services to pay directly Front Desk Vacation Rentals, LLC. any amount payable under the terms and conditions of the Vacation Rental Damage. Please contact Front Desk Vacation Rentals, LLC. directly if you do not wish to participate in this assignment. In the event you do not wish to purchase this plan, a $3,000 security deposit is required. TRAVEL INSURANCE: FDVR is pleased to offer the option of CSA Travel Insurance with your reservation. CSA Travel Insurance provides coverage for prepaid, nonrefundable expenses due to certain unforeseeable circumstances that may jeopardize your vacation investment and force you to incur unplanned expenses. We strongly recommend you purchase this valuable protection. Separate terms and conditions apply, read your Description of Coverage/Policy carefully and contact CSA at (866) 999-4018 with coverage questions. PETS: Dogs are permitted in some units, so please make sure you select a pet friendly rental by checking our property listing notes tab or by selecting “pet” during reservation process. (CATS AND OTHER PETS NOT ALLOWED) $25 per dog, per day will be added to your online reservation, 2 dogs max, some restrictions may apply. Guest will forfeit the entire Security Deposit payment and risk being evicted without refund, if there is evidence of pets in a non-pet friendly rental. Pet fee and cleaning fee doesn’t cover any pet cleanup left behind by guest. This includes properly disposing of all waste material and making sure no pet hair is left behind, an additional cleaning fee will be charged. Tenant must also maintain control of pet at all times and pet must be crated if left unattended. FDVR, its employees, and/or contracted labor are not responsible or held liable for any injury or damage caused by pet, to the home, its premises, or done to any individual during term of this agreement. Any complaints from neighbors regarding excessive noise or other nuisances may be cause for immediate termination of the lease and forfeiture of the tenant`s entire security deposit. Rottweilers, Pit Bulls, Dobermans, Chow, American Bulldogs or other aggressive dogs are not allowed at any of our properties. SUBSTITUTION/CANCELLATION/REFUND: Any change or cancellation to this reservation, MUST BE IN WRITING via email and a telephone call. Changing to a different property is not allowed 60 days prior to arrival. Despite our best efforts, some matters are beyond our control (i.e. act of god, plumbing, electrical, air conditioning, boat or jet-ski lift outage, cable, satellite or internet outage or sale of unit) and the unit may not be available. If this occurs, we reserve the right to substitute an equivalent or superior property at our discretion. If similar accommodations cannot be found, a full refund will be given to the guest. B. If you cancel your reservation 60 days or under, you will forfeit the GRAND TOTAL. C. If we can re-book any of your dates, you will only be charged any remaining unbooked dates. SLEEPING CAPACITY/DISTURBANCES/RENTAL FORFEITURE: Tenants and all other occupants will be required to vacate the premises and forfeit the rental grand total and security deposit for any of the following: A. Occupancy exceeding the max capacity stated on the reservation confirmation. B. Using the premises for any illegal activity including, but not limited to, the possession, serving or consumption of alcoholic beverages by or to persons less than 21 years of age. C. Causing damage to the premises rented or to any of the neighboring properties. D. Any other acts which interferes with neighbors' right to quiet enjoyment of their property. E.) Violation of the 10:00 PM “no loud outside noise or music” rule. F) Police called to property for any reason. HOT TUB, POOLS, PATIOS & LAKE SWIMMING: Tenant hereby acknowledges that if the reserved property includes a hot tub, swimming pool, or lake swimming on the premises, the undersigned is fully aware that the surrounding patio/deck can be dangerous, that the deck/patio can be slippery when wet, and that injury is likely to occur to anyone who is not careful. Tenants should observe and adhere to all rules and policies as posted at the property. With full knowledge of the above facts and warnings, the undersigned accepts and assumes all risks involved in or related to the use of these features. Please be aware that swimming in the pool, hot tub or lake can be dangerous at times and life guards will not be present. Please wear a life jacket at the lake at all times. CHECK-IN / KEY LOCK BOX: Check in time is 4:00 PM. Please inquire one day prior to check-in to see if early check-in is available. Keys WILL NOT be issued with a balance owing or without a signed rental agreement in the owners, or owner's representatives, possession. Please call the morning of check-in, after 10am to obtain key lock box information. If Tenant is caught checking in early, without prior approval, Tenant may be subjected to extra charges. CHECK OUT time is 11:00 AM. THERE MAY BE AN EXTRA CHARGE FOR LATE CHECK OUT AND PRIOR APPROVAL IS NEEDED. FDVR checkout form is provided in your email confirmation, under “Welcome Letter”. Please follow these instructions and fill out the form. If the form is missing, please call FDVR for instructions. A $75 per hour fee will be charged if you check out past the required check out time. You will be charged a full days rent if you’re not fully checked out of the property by 1pm. Please return all keys where you found them. Please call if you have a problem with the lock box. A $25 per item fee will be charged for any lost keys or failure to put rental keys back in the lock box. A $50.00 fee will be charged for any vandalization of lock box (i.e. changing the code, breaking the numbered buttons). If there is an issue with the lock box or you cannot open it back up to put the key in, please contact us prior to checkout, otherwise you will be charged. CLEANING: FDVR charges each tenant a non-refundable “cleaning fee” which is solely for the purpose of the following tasks: Cleaning floors (vacuum/mop), dusting, sanitizing bathrooms, washing all linens, making beds, folding and putting away towels, putting away clean dishes, wiping down surfaces, tables & appliances, inspecting the home & taking inventory on supplies. The rental “cleaning fee” does NOT cover excessive dirtiness, cleaning up messes or accidents, or failure to follow checkout procedures. YOU ARE REQUIRED to leave the property in the same general condition that you received it & to perform checkout procedures (such as putting all dirty dishes in dishwasher and started, hand washing any remaining dirty dishes, all trash is taken out of house and put in trash bins, return moved furniture/knick knacks/toys/games to their original places, cleaning up any spills, stains or messes (on counters, floors, stove top, furniture, linens) - overall, making sure the home is generally picked up and ready to be vacuumed, dusted and sanitized. If additional cleaning or work is required, appropriate charges will be deducted from your security deposit or billed out. BOAT DOCK / LIFT USE LIMITATIONS & INSTRUCTIONS: Please follow the rules listed here and rules posted at the property, if the rental has a boat dock with a lift. Renters are not allowed to use the boat lift at Cool Waters or Butterfly Beach House. 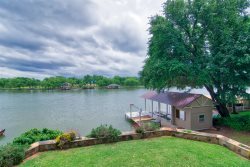 (Lookout Mountain, Christopher I & II are equipped with a v-drive wake board lift and can accommodate up to 8,500 lbs) All other homes are equipped with a 4,000 lb boat lift. Be extra careful if you have a wake board tower that could hit the ceiling. Exceeding the weight limit can cause serious damage, some examples are burning out the motor, breaking the motor belt, cracking the wood runners, bending the steel on cradle arm, or snapping the steel cable. Please remember to empty your ballast tank before lifting your wake board boat out of the water. Other options are to tie-up your boat in the covered slip or outside of the slip with rope and bumpers. PLEASE PAY CLOSE ATTENTION to the cable spool when lifting the boat in and out of the water. You could run the risk of unspooling the cable if it’s raised to high or lowered to the lake bottom. PLEASE REMEMBER TO RAISE THE LIFT OUT OF THE WATER AFTER CHECKOUT. Please call FDVR if you are unsure on how to operate boat lift. PRIVATE PROPERTY / NO TRESPASSING: Please stay on your rental property. It is difficult at some residences to discern property lines, as the homes are on the water and most have no fencing. Usually, they are divided by the boat dock, vegetation, signage, fencing, etc. Please do not trespass on neighboring properties, boat docks, or lake shoreline (i.e. getting out of water at neighboring waterfront). No fishing, sunbathing, etc on any other property other than your own. Trespassing, or notification thereof, will be cause for immediate evacuation of premises without rental refund. In addition, any water toys or recreational structures (ie. paddle boats, floats, tubes, docks, slides) that are not on your rental property are off-limits and are NOT to be used for any reason, under any circumstance. Also, see Section 7 on Sleeping Disturbances (for curfew, noise limitations). UTILITIES, SERVICES & AMENITIES: In the event of any equipment malfunction during your stay, please call FDVR, we will arrange to have the repair expedited as quickly as possible. Refunds will not be paid for any nonperformance of appliances, equipment or utilities, for any reason. We give you starters of paper & soap products, ie: One (1) full roll for each toilet and one (1) roll of paper towels in the kitchen. Starter quantities of laundry detergent, dish soap, dishwasher soap and hand soap are also supplied. ERRORS, OMISSIONS and CHANGES: Every effort is made by FDVR to insure that all information is as accurate and complete as possible on every website that we maintain, including HomeAway, VRBO..etc but it is not guaranteed. FDVR is not responsible for any inadvertent errors or omissions or for recent changes by an owner to their property. Policies, descriptions, conditions, rates and amenities listed are subject to change without notice. If a discrepancy arises between the rate quoted on the site and on the confirmation, the latter will prevail. In the event of an incorrect rate due to a typographical or other error, FDVR shall have the right to refuse, cancel or limit any reservations listed at the incorrect price, whether or not an order confirmation has been sent and/or payment has been made. Our Terms & Conditions change occasionally and you are bound to the most recent version posted on our website.. INJURY AND LIABILITY: Landlord/Owner (FRONT DESK VACATION RENTALS, LLC. and the homeowner) SHALL NOT BE RESPONSIBLE FOR ANY DAMAGE OR LOSS OF TENANTS PERSONAL PROPERTY. THE TENANT HEREBY AGREES TO RELEASE AND INDEMNIFY THE LANDLORD/OWNER FROM AND AGAINST ALL LIABILITY, SHOULD ANYONE (OVERNIGHT GUEST, DAY GUEST, PET) BE INJURED UPON THE PREMISES DURING THE TERM OF THIS AGREEMENT, RESULTING FROM ANY CAUSE WHATSOEVER. Tenant understands that there are special risks that may be involved in using special features such as the boat dock, swimming, water sports and using other areas of the property. Tenant agrees to explain the risks to any guest they may have at the property and to be fully and solely responsible for any accidents their guests may incur. Tenant understands above risks and agrees that they will assume all responsibility for themselves and guests for the consequences of those risks. HOLD HARMLESS: FRONT DESK VACATION RENTALS, LLC. and the home owners do not assume any liability for loss, damage or injury to persons or their personal property. Neither do we accept liability for any inconvenience arising from any temporary defects or stoppage in supply of water, gas, electricity or plumbing. Nor will Your Front Desk Services, LLC accept liability for any loss or damage caused by weather conditions, natural disasters, acts of God, or other reasons beyond its control, i.e. flooding, debris in water caused by weather, or any conditions caused by acts of God. CREDIT CARD AUTHORIZATION: Guest agrees to provide Manager with a valid credit card for the duration of the reservation. Guest is providing the credit card as a guarantee. Guest certifies that he/she has read and agrees to abide by the terms of this agreement, and agrees to pay and authorize Manager to charge any rental amounts, taxes, security deposits, extra cleaning, missing property and any damages not covered under the Security Deposit Protection and fines or charges pertaining to violations of the rental agreement. Guest understands that all credit card sales are final. Should manager be unable to recover costs from the credit card on file, Guest is responsible to provide an alternative method of reimbursement within 48 hours of notification. *Guest is required to submit the terms and conditions and registered guest list via email, mail or by signing digitally online.